Between vineyards and valleys Between vineyards and valleys, a territory of vineyards and little villages of charm, full of character and good food. The balcony of the Pyrenees Astarac ans Adour Valley, the tranquility of the small villages at the edge of the water, for a relaxing and quality holiday. Auch and the heart of Le Gers Discovering the beautiful city of Auch, the beautiful fortified villages and perched of this territory full of delicacies and surprises. The gates of Gascony Discover the country of the gates of Gascony, the markets "marché au gras" to buy foie-gras, the Gascony traditions, beautiful towns and villages. Parties and events in le Gers A list of all events and parties in Le Gers, classified by season and month. Let's go ! THE GERS IN THE CINEMA, IN BOOKS, FAMOUS GERS PEOPLE Discover Le Gers through films, books, and famous people living in Le Gers. Rurality and nature in Le Gers The Gers is a rural department, nature is everywhere. Discover the pleasures of a holiday in the countryside ! Pilgrimage to Santiago de Compostela in the Gers Discover the two important Paths to Santiago, that cross the Department. Getting to Gers Getting to Gers? How to get there? Farm B&B and Self-Catering Cottages Welcome in Gers Farmer's House! Gastronomy, specialties and local products Discover the gastronomy, the local products and the specialties of the Gers. Cooking recipes The art of Gers cuisine, the essential recipes. 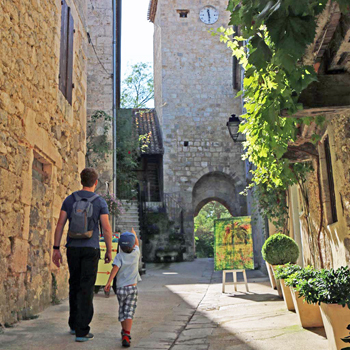 Discover the unique round bastide in Gers ! On of the most beautiful village in France, beautiful nature all around, a castle and of course, a lot of vineyards ! Let's go to Fourcès ! The restaurants of the Gers Our addresses here! Theme Parks Enjoy the Gers! La ferme d'en Cagalin GERSEMENT GOOD in Aubiet ! O Farmer's Market Barcelona Fair!